"VJ Celebration Live on the Streets of Hollywood"
December 7, 1941, the date which lives in infamy, was a mistake, and everyone who knew anything knew it was a mistake. The architect of the Pearl Harbor Attack, Admiral Isoroku Yamamoto, had hoped that the attack would be a decisive and crippling blow against the American military presence in the Pacific, it was not to be. Yamamoto has been quoted: "I fear all we have done is to awaken a sleeping giant and fill him with a terrible resolve." Hitler knew it was a mistake, the War in Europe to that point had mostly gone his way but drawing the United States into the conflict was more than the Nazis would be able to handle. Pearl Harbor was far from the beginning of the Second World War. For Europeans, the conflict officially began on September 1, 1939, when German forces crossed the border with Poland. In Asia, the War was an extension of the Second Sino-Japanese War which began on July 7, 1937, although some historians say the conflict began with the Japanese Invasion of Manchuria on September 19, 1931. Officially, the United States was desperate not to be drawn into either the Asian or the European conflicts, although She had already 'chosen sides' in both conflicts. Hitler was the enemy of our friends, and the US had thrown her diplomatic weight in support of the Republic of China. That America would be drawn into the War seemed inevitable, but delaying her entry was in the best interest of the Axis forces. After Pearl Harbor, America with all her industrial and economic might was forced into the fight. In spite of that might, things did not go America's way at first, especially in the Pacific and Indian Oceans. Our strongest allies in Asia were the Dutch and the British Empire who were both fighting for their lives against Hitler. If the Empire of Japan had bloodied Uncle Sam's nose in the early days of the War, it had absolutely wiped the floor with the British. The oil resources of the Dutch East Indies were an easy target for the Japanese, and the English bastions of Hong Kong and Singapore soon fell. Although America was virtually alone in the Pacific Theater, she supported her allies with a "Defeat Hitler first" strategy. The American forces in the Pacific managed to fight the Japanese to a draw in the Battle of the Coral Sea in May 1942. The Japanese response was an attempt to seize Midway and draw the American aircraft carriers into a decisive final battle. With a combination of military intelligence and just plain luck, Midway held and the Imperial Japanese Carrier force was routed. The Americans began an island-hopping campaign at Guadalcanal which led to bloody battles in the Solomon, Gilbert, Marshall, and Caroline Islands. Franklin Delano Roosevelt, who had led the United States for more than a decade and oversaw the sensitive preparations for the War, passed away on April 12, 1945, with Victory in Europe just days away. Hitler committed suicide on April 30, and on May 8 (VE Day) the Allies accepted Germany's unconditional surrender. The American island-hopping campaign had taken Iwo Jima, which put Tokyo in range of incendiary bombs dropped from B-29s. The Army and Marines were struggling across Okinawa and the invasion of the Japanese home islands was the next logical step. The experience of Okinawa, however, demonstrated that invading the home islands would have a terrific cost in American lives. When Harry Truman moved from the Vice Presidency to the Oval Office he was briefed on the development of a horrific new weapon which had been secretly created by the Manhattan Project, the Atomic Bomb. Victory over Japan without the bomb was without a doubt, but the cost in American lives was incalculable. 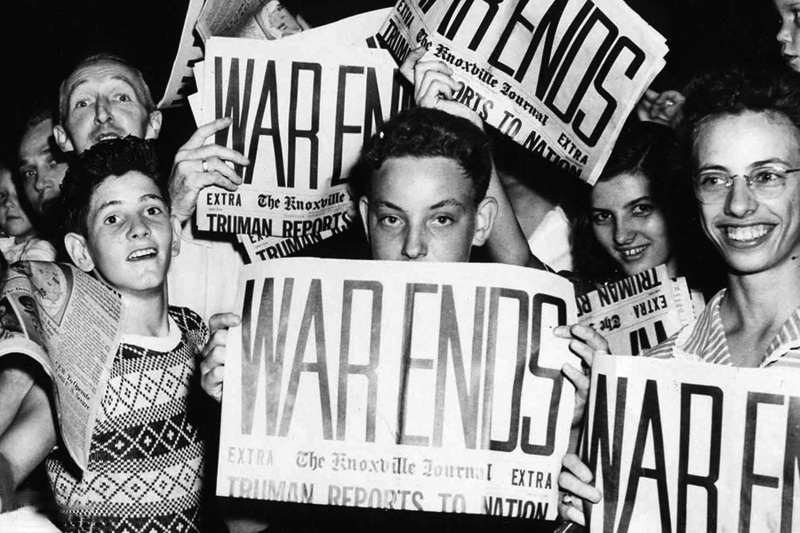 Truman ordered the Bomb to be dropped. After devastating Atomic attacks on Hiroshima on August 6 and on Nagasaki on August 9, the Japanese government communicated its intention to surrender under the terms the Allies had outlined in the Potsdam Declaration. Just after noon on August 15, Emperor Hirohito's announcement of the surrender was broadcast to the Japanese people (it was the first time Japanese citizens outside the Imperial Court had heard their Emperor's voice). 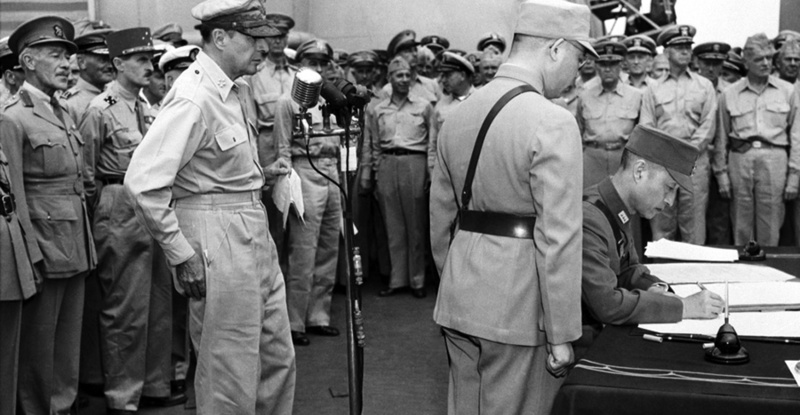 The Instrument of Surrender was signed on the deck of the USS Missouri (BB-63) on September 2. Broadcasts included in this collection are from 12-hour broadcasts of WEAF on August 10, 1945 and VJ news broadcasts from August 14, 1945. Officially, V-J Day (for "Victory over Japan) was not celebrated in the U.S. until the signing of the Instrument on September 2, but in Great Britain, V-J Day was celebrated with the surrender announcement on August 15. Indeed, the American people began celebrating on the 15th. American servicemen were "kissing anything in skirts who came near enough". 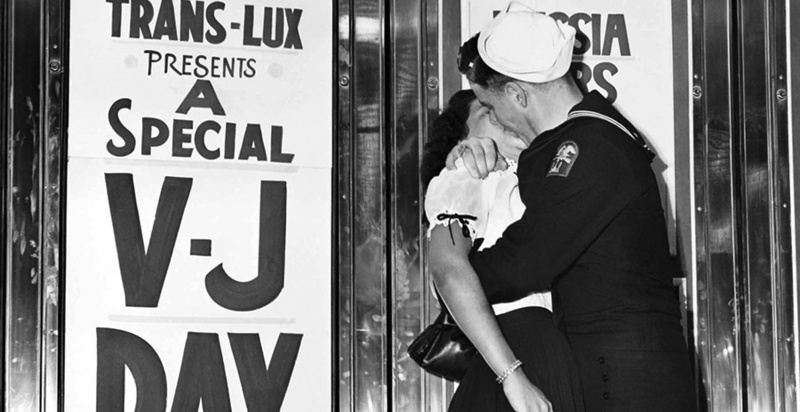 Several of these kisses were memorialized in photographs, but in many cases, the participants went unnamed in the exuberance of the moment. The identity of the kissers is probably not that important. A hard-won peace was at hand, and America needed a kiss. We know it well! It’s a state holiday in Rhode Island; We’re the only state in the union that still celebrates it.